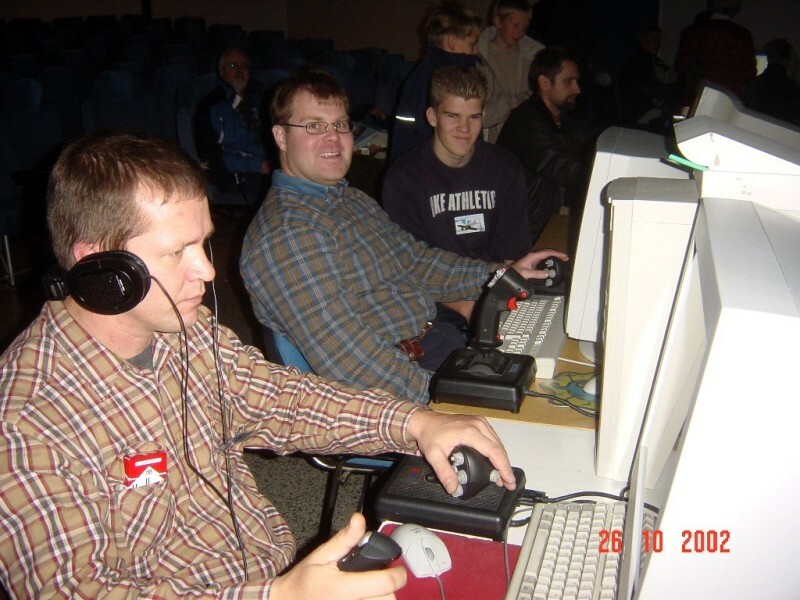 Virtuaalilentäjät - Virtual Pilots ry, association of Finnish WW2 online simulator pilots gathered October 2002 to participate again in the Finnish Aviation Museum's Aviation Hobby Days (Ilmailuharrastepäivät) -exhibition. 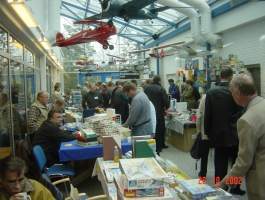 The exhibition gathers annuallu several thousand people interested about aviation to the museum, from small shops bringing their catalogue for sale to aviators and families. Our association was invited by the museum staff to participate, so we did some preparations and arrived with a hitsquad to demonstrate what online and simulator flying is about. Usually we had about a dozen Association members around chatting with the exhibition visitors and alltogether some two dozen or more members were present in the exhibition. We were located in the museum's auditorium / movie theatre, right next to the main entrance, and showed the fine art of online flight simulators for the whole two days. Demonstrations included non stop video output from one of the PCs to the theatre's bigscreen. Alltogether we had 3-5 PCs, depending on situation, showing simulators. At times all machines were showing same simulator, flying in same online environment or then showing different sims per request. We were equipped with Aces High, WarBirds III, World War II Online, IL-2 and European Air War simulators. Generally WarBirds III and IL-2 were the sims that were shown most after all, with one machine dedicated purely for European Air War and its fancy Finnish Winter War / Continuation War addons. Our idea was to have fun there, show modern simulators and maybe to attract new people to the online environments. 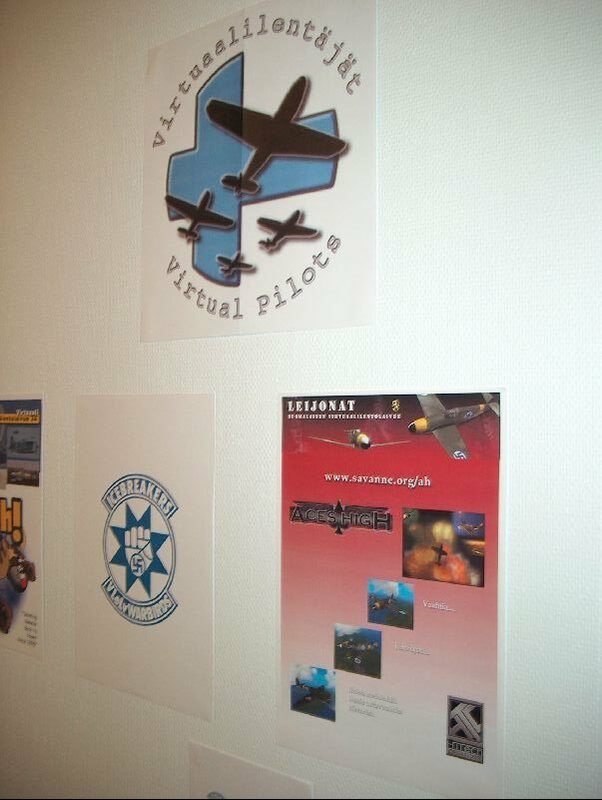 Suomen Virtuaali-Ilmailijat ry, simulator enthusiast association dedicated to civilian airliners simulator flying, shared the exhibition with us. With two associations we were able to show simulator hobby from all "corners", flying with guns and without. Excellent combination! Mr. Uotinen was in the exhibition signing a new Junkers Ju 88 -featured painting by Sture Gripenberg. He used the opportunity to check us, as we had an interview booked next month. Seems he was satisfied to what he saw. We of course showed him the simulators and demonstrated the WarBirds III Junkers Ju 88. Another Blenheim bomber war pilot also came around to see what kind of guys we are, and that's another interview for the future. During the weekend we talked with hundreds if not thousands of people, handing fliers and spreading the good word about simulators, even recruiting some interested people to join the association. We also met loads of big, important names in the Finnish aviation history circles and spoke about possible future cooperation. Kossu showing off the FAF Bf 109 G-6 skin in WarBirds III. RaimoK, Pietu, Sture Gripenberg and BlauKreuz watch as Netfly sweeps the floor with Camo in the EAW Fiat G.50 vs I-153 Chaika H2H match. One of the main attractions in the exhibition were the Finnish Messerchmitt 109 G "skins" (or paintjob, camouflage) just added to WarBirds III. The Messerchmitts are based on real WW2 planes, on real pilot's. More information about the 109s here. "Actually WBIII has taken about 80% of the time, because everybody wants to take a Finnish Air Force Messerscmitt for a spin. If any of you saw me (kossu-) or --my-- or koko-- online today we weren't on ourselves that much, if at all. We were giving rides to the Veterans, Museum associates, researchers, war and aviation writers and artists, regular visitors of the show and their kids etc., etc." The Finnish fighter ace of 32 victories Kyösti Karhila (Curtiss Hawk 75, Me 109 G) visited us once again and was kidnapped. Must admit it was quite amusing, I wondered where half the guys are and where "Kössi" has disappeared, then I found them crammed to the corner of the cafeteria. 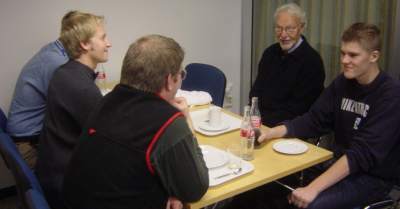 Mr. Karhila was introduced to the SVIL, the civilian sims guys, as after the war Kössi flew in the Finnish airlines company Finnair as pilot for several decades. Grendel during the exhibition: "One fun thing what happened today was when I asked mr. Karhila to visit the civilian simulator people, who were our guests in the museum theatre. On our way past our stand we noticed that Koko and Julle were flying World War II Online - and flying Curtiss Hawk 75s. Well, I just had to stop right there and point out the situation to "Kössi" - because he just happens to be the world's leading Curtiss Hawk 75 ace! It was very fun watching them two flying Hawks against 109 Es - with mr. Karhila commenting on the Hawk behaviour and us watching Koko pour and pour bullets on one very persistent 109 until it finally succumbed to its face. It was amazing! Finally I had to then drag mr. Karhila away and get him to the civilian virtual airliners. Karhila has "only" some 27000 flying hours in the Finnish airline company Finnair." During the Mosquito Meeting of last summer, the Brewster / Messerschmitt ace Hemmo Leino received a T-shirt with the Lentolaivue 34 "Eagle Fledgling" squadron emblem. We ran out of T-shirts and the Curtiss / Messerschmitt ace Kyösti Karhila was left without. A promise was made: "Kössi" would get a shirt as well! At the hobby days we finally fulfilled our promise and gave him a shirt as well. After the T-shirt changed ownership, we kidnapped the gentleman and headed to the cafeteria for some reindeer stew and mashed potatoes. The famous air historian Carl Geust also sat down and we had an interesting discussion about the Soviet military archives, the Finnish kill claims and Soviet losses. Many planes that the Finns only claimed as damaged, have been confirmed to have been actually destroyed. On the other hand, all kill claims cannot be confirmed from the Soviet archives. In many cases though, the Soviet loss can be tracked down to the pilot name and plane manufacturer number! Of course, we also discussed "Kössi's" war time experiences, his relationship to the career officers, flight- and squadron commanders, as Karhila was "only" a reserve pilot. Although, arguably the best reserve pilot in the Finnish Air Force! 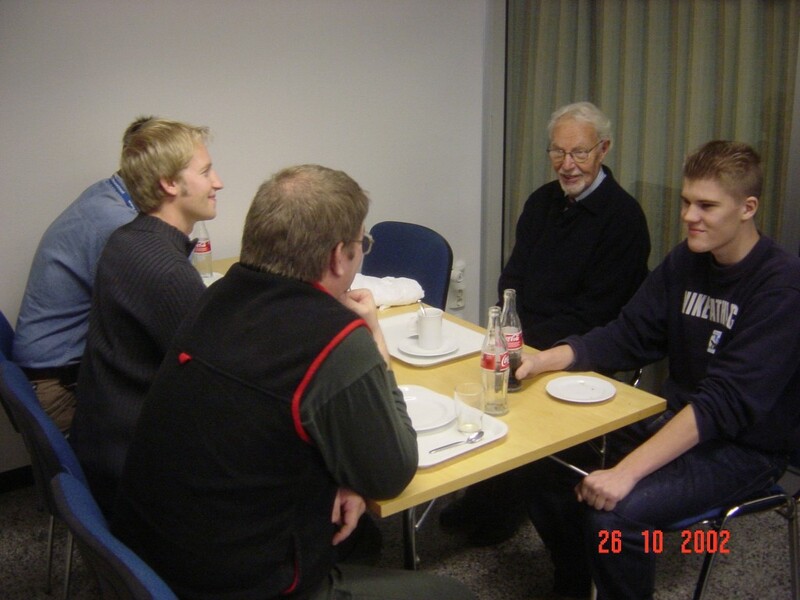 The picture above shows the Virtualpilots' chairman Kossu, Camo, Buffalo and Netfly chatting with "Kössi". Vertical stabilizer of "BW-393", the personal mount of 1./LeLv24 CO Eikka Luukkanen and later 3./LeLv24 CO Hasse Wind. The photograph shows Wind sitting on the horizontal stabilizer. Wind's victory markings are visible, but below them you can also see the faint Karelia beer label victory markings of Luukkanen! BW-393 is arguably the most succesful single airframe in the history of air combat, with 41 confirmed aerial victories. IPMS Finland, amazing fellows! And seems we got a lot in common. Article by Jukka O. Kauppinen aka Grendel. More good pictures of course welcome.